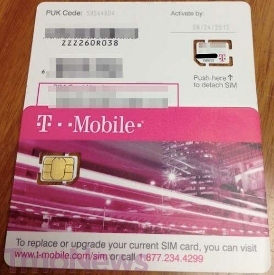 Slightly earlier than expected, but T-Mobile have apparently taken delivery of the new nano-SIM cards for use with the iPhone 5. Remember that the iPhone 5 is the only phone on the market at the moment that uses the nano-SIM card format. The nano-SIM card is smaller than the micro-SIM card which was used for the iPhone 4S, and it’s also thinner. With a T-Mobile nano-SIM it means that it will now allow unlocked versions of the AT&T and Verizon iPhone 5 to be activated on T-Mobile’s HPSA+ network. Apple don’t actually sell iPhone 5 devices with T-Mobile, so the carrier had to think fast and decided to get AT&T customers to take their (unlocked) iPhone devices to T-Mobile. The con to this is that you will only be able to use the 2G EDGE network until 4G LTE is rolled out. At the moment plans are in motion but it may still be a while away until we see 4G LTE for T-Mobile. How much will unlocked iPhone 5’s sell for? This is what will probably put a few of you off. You are looking at $649 – $849 depending on the memory capacity you chose.